Facebook/Marion & Flo – The Travelling ShedMarion Henry and Florian Fradet, both 25, are living the dream, along with their pets. 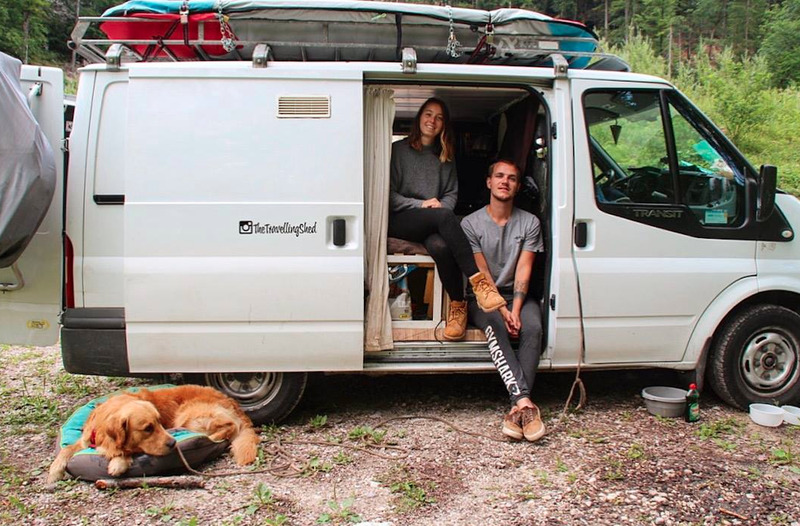 Marion Henry and Florian Fradet, both 25, quit their jobs in marketing and engineering for a life on the road. They converted an Old Ford Transit into a mobile home for under £4,000. They have taken their pets Lewis and Sacha with them, too. They have now clocked up over 26,000 miles throughout Europe. Many of us dream of packing it all in for a life on the road where all you have to think about is your next swim or picnic spot. But for most of us, the realities of commitments such as work, family, and even pets stop us from taking the plunge. Commitments didn’t stop one couple from making it happen, though. Marketing manager Marion Henry and civil engineer Florian Fradet, both 25 from La Rochelle, France, quit their jobs to travel around Europe in a converted van along with their cat and dog. They bought an old Ford Transit van in 2016 and converted it into a mobile home. The conversion cost them almost £4,000 and took six months, according to the Daily Mail. They call it “The Travelling Shed” and write about their adventures on their blog, as well as on Instagram. They initially got the van for weekend getaways and holidays, but after two trips – to the Basque country and Switzerland – they realised they wanted more. So they sold their possessions, packed up, and embarked on a full-time road trip around Europe – with their pets, of course. They have made it pretty homely inside, and have certainly made the most of the tight space. The pair said they have already clocked up 26,000 miles travelling, and have visited the south of France, England, Scotland, Wales, Germany, Austria, and Slovenia, where they’re currently chilling out. So what does an average day look like for them? “Our daily routine is we wake up around 8 a.m., fold out the bed, and take some time to prepare the breakfast and drink a cup of tea,” he went on. This doesn’t look like a bad place to flip your morning pancakes. “We then clean the van and move to our next destination, where we’ll do some activities like hiking, paddling, swimming, or chilling,” he continued. “We usually take a shower at night after a good day of outdoor activities, then we read or draw before sleeping,” he added. They haven’t had to leave anyone behind either – they have taken their pets Lewis and Sacha with them. Fradet said that living the van life is just the same as living in a regular home. They still have to keep up with chores like cooking, cleaning, and taking the dog for a walk. They have the freedom to just park up in idyllic settings just like this, though. Marion said this way of life comes highly recommended. “It’s a fantastic adventure,” she said. “Don’t be afraid to quit your job and buy a campervan. We can decide each day what we do, and we can change when we want to. Croatia and Italy are next up on their summer destination list, then they plan to return to France in September.